Just a quick announcement about an out-of-print game making a comeback this fall. 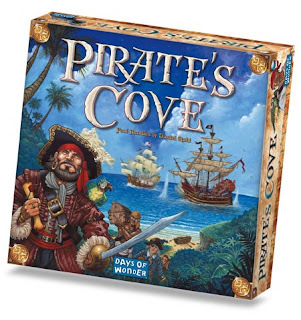 In just over a month, the Days of Wonder gem, Pirate's Cove, will be re-printed. I am very excited about this games because (a) I enjoy it very much, (b) its always stupidly expensive in auctions because everyone knows its a great game that is out-of-print. The game is scheduled to return to North American game stores September 19th - appropriately enough on International Talk Like a Pirate Day. The game was originally released in 2003. Paul Randles & Daniel Stahl, the designers, are natives of Seattle, WA. Paul's game development career began at Wizards of the Coast, where he worked on such games as Robo Rally and The Great Dalmuti. Sadly Paul was stricken with cancer and passed away in Feburary, 2003. Daniel is still designing games out on the west coast. "My Game of the Year 2002!" 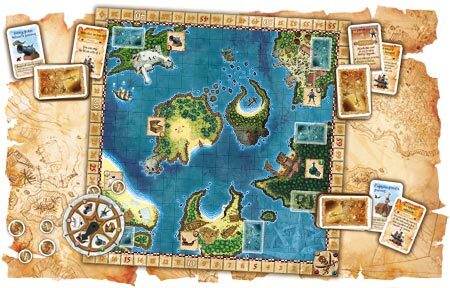 Bruno Faidutti - "Pirate's Cove is a family boardgame of the kind that were published in the eighties. A little bit of strategy, some bluff and double guessing, lots of player interaction and dice rolls, and, most of all, a strong and convincing theme with components that fit in perfectly. ... It's the kind of game that I could have made or, at the very least, would have liked to." "One of the best themed games, ever." Tom Vasel from DiceTower Reviews.